For fans of Studio Ghibli — myself included — The Kingdom of Dreams and Madness might be the last peek behind the curtain at one of the most original movie studios in history. Studio Ghibli produced such animated masterpieces as Grave of the Fireflies, My Neighbor Totoro, and Princess Mononoke. The studio started in the mid-1980s, and its latest — possibly last — films are being released in the mid-2010s. The Kingdom of Dreams and Madness is a documentary filmed at Studio Ghibli while they were pushing to finish both Hayao Miyazaki’s The Wind Rises and Isao Takahata’s The Tale of the Princess Kaguya. Rather than tell the history of the studio chronologically, The Kingdom of Dreams and Madness lives in the present. Filmmaker Mami Sunada looks at the daily routine of Miyazaki-san and the myriad employees who join him. For example, Miyazaki works from 11:00 am to 9:00 pm, sharp. There are 400 employees, including the Ghibli museum. They all stand to do calisthenics together throughout the day. The only employee who wears a suit is Nonaka-san, their lawyer. 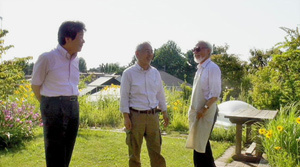 Miyazaki wears his usual apron-over-sweater-over-Oxford, accenting his big square glasses and white pushbroom mustache. He is so recognizable that a young fan sends them a picture of himself dressed as Miyazaki at a comic convention — a touching tribute I wish I’d thought of. Miyazaki rightly dominates the screen time. He smokes. He opposes nuclear power, especially after the tsunami. He picks up trash on his way to work as part of his routine. We stick with him long enough to hear him sound crotchety — about government debt, the state of cinema today, and how nobody bows correctly anymore. Some people discuss on-camera the personality clash between Miyazaki and Takahata. Other office politics come to light. It’s never quite at the level of “dirty laundry,” but it’s enough to show that working with a perfectionist isn’t always happy or easy. Linking the various scenes of life at Ghibli are shots of lighthearted B-roll. There is a cat with a freckle who lives on the grounds. Ghibli has goats, too. The walls are covered with sketches, photos, mementoes. The architecture is playful and linked to Ghibli films — fan blades are made to look like airplane propellers (airplanes being a frequent theme in Ghibli movies). Eventually the documentary digs into Ghibli’s history, trotting out stories about the founding of the studio, the meeting of prominent minds, and the genesis of memorable scenes or characters. There doesn’t seem to be any rhyme or reason why some anecdotes get included. Perhaps Sunada just used all of her best material. The Kingdom of Dreams and Madness feels scattered and random, and its nearly two-hour running time — long for a documentary — makes it seem even more so. Essential viewing for any fan, The Kingdom of Dreams and Madness would probably be tedious for anyone who doesn’t know what a Totoro is. Regardless of what happens, Ghibli’s creations will live on at revivals and on home video. ... And, I sincerely hope, decades from now, people will still dress as Miyazaki-san at conventions.